Carol Shea-Porter was a Democratic member of the United States House of Representatives, representing the 1st district of New Hampshire. Shea-Porter first served in the U.S. House from 2007-2011. She lost to Frank Guinta in the 2010 general election, but she was victorious in the November 2012 rematch. As the first woman to ever be elected to a federal office from New Hampshire, Carol Shea-Porter knows what it takes to break down barriers. In 2006, she defied the odds to defeat a longtime, rubber-stamp incumbent and has been fighting for New Hampshire families in the US Congress ever since. Growing up in a home with six brothers and sisters, Congresswoman Shea-Porter worked her way through college and earned an MPA from the University of New Hampshire. After college, she moved to Washington, D.C. where she worked as a social worker and teacher. She founded and directed a program to provide services to senior citizens, taught Political Science at a local community college and American Politics and History to recently retired federal employees. Congresswoman Shea-Porter went to New Orleans after Hurricane Katrina hit to serve as a volunteer for a month. There she witnessed first hand the failure of the government to react to those who needed help the most. It was after her time in New Orleans that she decided to run for Congress. 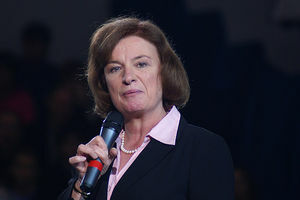 While on the campaign, Representative Porter made a promise to listen to voters and represent the middle-class families of New Hampshire in Washington, D.C. Her hard work paid off as she built a massive grassroots organization and accomplished one of the biggest upsets of the 2006 Election Cycle. Once elected to Congress, she was appointed to serve on the House Committee on Education and Labor where she worked to improve the economic position of New Hampshire’s families by leading the charge to increase the minimum wage, lower the cost of college and protect the rights of workers. Her efforts were rewarded when three new laws were enacted. But the job isn’t done. Representative Shea Porter is pushing to extend unemployment benefits, allow taxpayers to deduct state or local property taxes from their federal income taxes and provide a refundable tax credit of up to $500 for home heating oil expenses. Shea-Porter received $8000 in lobbying funds from Planned Parenthood in 2008. Shea-Porter has been supported by EMILY's List during her campaigning. The Council for a Livable World, founded in 1962 by long-time socialist activist and alleged Soviet agent, Leo Szilard, is a non-profit advocacy organization that seeks to "reduce the danger of nuclear weapons and increase national security", primarily through supporting progressive, congressional candidates who support their policies. 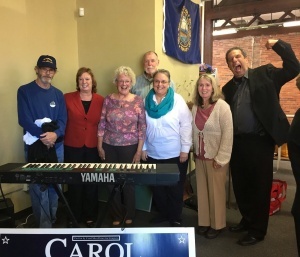 The Council supported Carol Shea-Porter in her successful 2008 House of Representatives run as candidate for New Hampshire. She has also been previously supported by the Council. The Council supported Shea-Porter in her 2010 Congressional election campaign. Carol Shea-Porter was supported by Council for a Livable World again in 2016. Carol Shea-Porter received both her BA in Social Services and her Master’s in Public Administration from UNH. She had a rewarding career helping others as a social worker, administrator, and as the founder of a non-profit social service agency. She also taught Politics and History at a community college. Shea-Porter thinks that the United States should “Use soft power, diplomacy, humanitarian assistance, financial and food aid, unless military action is absolutely essential. Military action should be a last resort.” Shea-Porter believes that diplomacy is the way forward and that we should encourage regional cooperation and continuing international efforts at the United Nations. Shea-Porter also believes that nuclear security is a pressing issue and that we should continue to pursue nuclear non-proliferation and arms reduction treaties, including the agreement to prevent a nuclear-armed Iran. Long-term, she supports the vision of moving towards a multilateral and verifiable nuclear-free world. Furthermore, she believes that we need to make rational cuts to our defense budget. Shea-Porter established a consistent voting record in the House of Representatives, scoring 89 percent on the Council for a Livable World Legislative Scorecard. Carol Shea-Porter was on the list of 237 speakers at the 2007 Take Back America conference, which was organized by the Institute for Policy Studies, and Democratic Socialists of America dominated Campaign for America's Future. Shea-Porter was one of 12 key progressives endorsed by 21st Century Democrats in the 2012 election cycle. She was also supported in 2008 and 2010. The Populist Caucus was founded on February 11, 2009 in the United States House of Representatives by Democrat Bruce Braley of Iowa. The caucus originally included 26 other Democrats in the House, including Carol Shea-Porter. 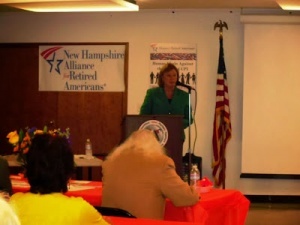 Board members and staff of the New Hampshire Alliance for Retired Americans met with Congresswoman Carol Shea-Porter, Feb. 2013, to talk about Social Security and Medicare. 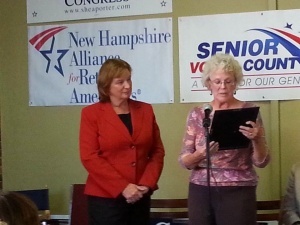 The Alliance for Retired Americans endorsed Carol Shea-Porter in 2014. Signatories included Rep. Carol Shea-Porter..
As a former social worker, community activist and community college instructor, Shea-Porter won some fame for being escorted from a George W. Bush rally wearing a T-shirt that read "Turn Your Back On Bush." She opposed the Iraq war and her voting record has been much better than previous Republican's who held this seat. In 2017 Carol Shea-Porter was a new member of the Congressional Progressive Caucus.